BMW WENT retro a while back with the R nineT, a bike which had the styling of yesteryear with modern performance, electronics and reliability. Now we have the R nineT Scrambler and next year a couple more models join the Heritage range, as BMW is now calling the bikes. Designed around a philosophy of style, customisability (hey, I just invented a new word!) with a dose of practicality, both the R nineT and the new Scrambler variant offer a stylish flat-twin powered, easy to ride and own good-looking motorcycle. It’s a little bit 1950s British Scrambler, a little bit 1980s R 80G/S, a little bit R 90… the influences are many and varied, but the result is an interesting looking bike which shouldn’t work – but it does. The fittings and design touches are almost steampunk, especially the air intake tubes running under the tank, the frame brackets under the rider’s part of the seat, and the pressings and pads on the tank itself. The wheels are black cast alloy, where they should be laced… the fork gaiters are retro too, with 43mm conventional forks. There’s a small, round headlight, single circular instrument on the top triple clamp, shorty black front mudguard and an interesting collection of colours – our test bike came in the gun metal grey (tank, rocker covers, headlamp body) while most of the engine is black, as are the wheels, fork lowers and shaft drive. But there’s a brown seat and (optional) knobby tyres… so it is distinctive and unusual, which is part of the point, and if you like the concept but aren’t taken by the execution, customise it to suit yourself. I can remember when 110 horsepower (81kW) was considered pretty stonking, but these days it’s mid-range stuff, so don’t expect anything eye-watering, but that’s OK – it makes great torque in the mid-range and the bottom-end is healthy, too. It’s a very pleasant motor, developing a good spread of power and is nice to use. Maximum torque is at just 6000rpm, so you certainly don’t have to rev it hard. The engine itself is a variation of the Boxer-twins BMW has been running for decades. There’s an oil cooler bolted to the frame above the front mudguard… if you’re serious about doing some scrambling I’d look for a guard, you don’t want to punch a hole it it… but it’s nice and high and out of the way. Between the fins on the pots and the oil the machine keeps its cool reasonably well, although you do notice some radiant heat on warm days when in traffic. The motor is fed by fuel injection which was beautiful to use – throttle response was good, there was no hunting or hesitation. BMW is still using a single-plate dry clutch on it’s Boxer twins, but the company has developed them to be far more progressive than in the bad old bays, although I still found the actuation a little heavy – but on the plus side it’s hydraulically-operated and has a five-position lever, just like the brake. The gearbox was slick, tight and positive, easily the best gearbox I’ve ever used on a boxer twin. Want to make your Scrambler a single-seat version? Easy, unbolt the rear section of the tubular space frame which is only there to hold up the pillion accommodation and switch out or shorten up the seat. BMW’s specially designed the Scrambler’s tubular space frame to be easily modified. It uses the engine as a stressed member of the frame, so there’s front section joining the engine to the steering head and rear sections for the swingarm and passenger. All this results in a riding position which is neutral and comfortable. There’s room to the footpegs from the seat, the reach forward to the ’bars gentle. With no wind protection leaning into the breeze is a good thing, it makes the Scrambler comfortable: even at speeds beyond the highway limit. For off-road use standing up is not just achievable, it’s actually quite comfortable. It’s a shame I can’t say the same thing about sitting down – I found the seat to be pretty thinly padded, giving me a sore arse sooner than I would have expected. 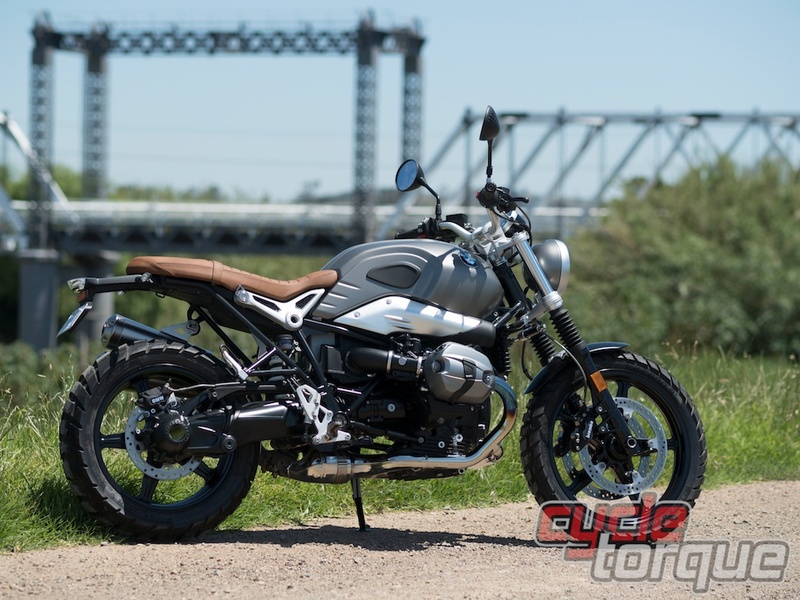 BMW appears to have thinned out the original R nineT’s seat to keep the seat height low, but in the process made it less comfortable, which is a shame. The bike steers really nicely considering it has a 19-inch front wheel. I expected the steering to be slow, and it is, but it’s good slow, not bad slow… Entirely predictable and consistent, the Scrambler doesn’t like to be slammed hard over into turns, preferring a more measured old-world style of gentle cornering, but it’s confidence inspiring and fun in the twisties. Interestingly, the Scrambler only offers 5mm more wheel travel than the standard R nineT… although that doesn’t mean it can’t be ridden off-road, it just means this isn’t any sort of GS. The footpegs feature removable rubber inserts, the optional tyres are aggressive adventure-style Michelins, the optional Akrapovi? high pipe looks ready for river crossings and the mimimalistic seat appears highly functional – but it’s an illusion, it’s style… if you want Adventure: buy a GS. Like all modern BMWs, there’s lots of fancy techno-wizardry hiding under the heritage styling. Our test bike came with ABS, traction control and heated grips. Now, I totally get it that you might not want to pay for traction control on a 110hp twin, but it will make it easier to sell the bike when the time comes, and those chunky tyres might spin up in the wet at times, too – so I’d recommend you get as many of the bells & whistles the budget can afford. The Scramber is priced at $19,150 (+ORC) with the ABS and heated grips. Options include the knobby rubber, various aluminium tanks, alarm, spoked wheels and the Akrapovi? pipe as fitted to the test bike. BMW’s fitted a wring loom to the bike which allows for easier customisation than on most of its models, too. In my time with the bike the traction control and ABS only kicked in on loose surfaces, so I switched them off after that… there isn’t any fancy modes for the ABS and traction, just on or off, which I think is fine for the Scrambler. The current BMW Boxer twin installed in the Scrambler is a big, lumpy donk with a character you’ll only find on bikes which have the crankshaft spinning in line with the machine – blip the throttle at a standstill and people think it wants to throw itself on its side. However BMW designed the Paralever shaft drive to take out most of that momentum when moving, so you don’t notice it once your feet are on the pegs, but you still know you’re riding a lumpy twin cylinder machine. It’s a relaxing thump, providing a beat to the ride. The Scrambler is one of those rare bikes which is comfortable around town – for a big lumpy twin – but also in the countryside – for an upright naked. Ridden aggressively the Scrambler won’t get too far out of shape or do anything unexpected, but with only 110HP available, don’t think you’ll keep up with your mates on S 1000 XRs or the like. The Scrambler is more about enjoying the ride at a comfortable speed, and it’s not too fussed about the road surface – gravel roads should be included on the journey, for they are good fun. Just turn off the traction control. 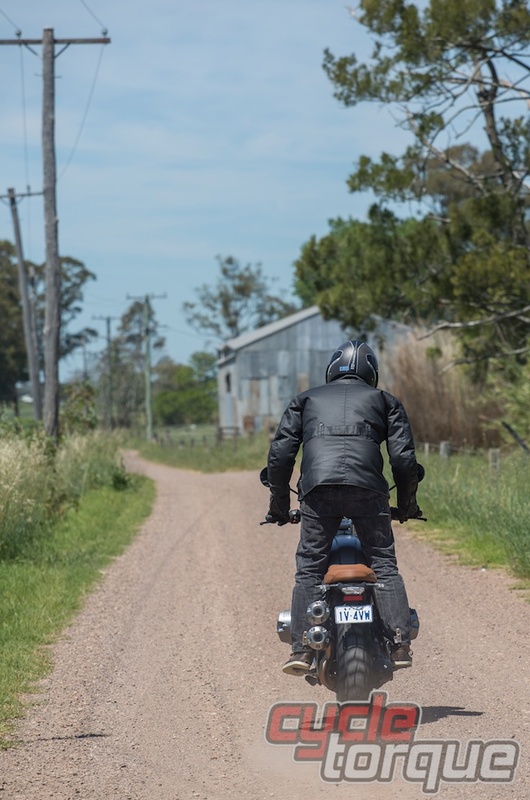 The Scrambler has the turning circle, suspension performance and electronics of a road bike. Sure, it’s probably better on a dirt road than a standard R nineT, but it’s not the spiritual successor to the R80G/S or more practical HP2 I was hoping for. I suppose I was expecting too much in hoping for a successor to the R 80 G/S (which is really the F 800 GS range), but I really was expecting a bit more off-road capability than the R nineT Scrambler can actually deliver. 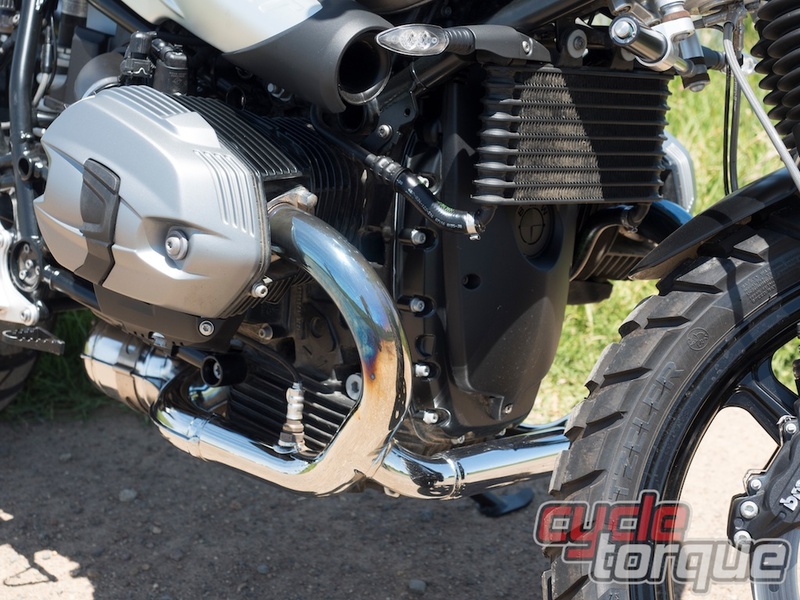 I mean, the bike comes standard with cast wheels… yet the earlier R nineT had laced items, which are easier to repair if dinged, something much more common in off-road bikes. The problem is in expectation, not execution – there’s nothing wrong with the R nineT Scrambler a better padded seat won’t fix. Once I got past what I wanted the Scrambler to be, rather than what it is, I enjoyed it immensely. If you like the style, you will too. BOOKINGS are now open for the 2016 BMW TS Safari, which will be run from the Tweed to the Blue Mountains, March 13-18.